Arsenal manager Arsene Wenger has admitted he will need time to recover from a traumatic final season as the club's manager, after his side crashed out of the Europa League after a 2-1 semi-final aggregate defeat against Atletico Madrid. Diego Costa scored the only goal of the second leg to rubber-stamp Atletico's progress into the final in Lyon, with Wenger confessing his despair will take some time to recover from. "I’m like the team, very sad and very disappointed. Overall I’m even very frustrated as well," stated Wenger. "When you go out of a competition and give the performances we did over 180 minutes, it’s very difficult to take. "Now for the club, they’ve got some time to think a out what to do for next season. I think there are some good ingredients in our team and they will bounce back. These players have quality and with the right additions in the summer, they have the ingredients to compete next year. "I have to recover first from that huge disappointment tonight. I’m very, very sad to leave the club with this exit. I will take some time to recover from that and then after I will see what I will do with myself in the future." Arsenal will end the season with no silverware and look like finishing sixth in the Premier League, the worst placing of Wenger's reign and former Gunners defender Martin Keown pointed an accusing finger at Mesut Ozil, the club's highest paid player, for his latest ineffective display. "I haven't been happy with him for some time," Keown said of Ozil. "It seems as though he picks and chooses his games. He was on the edge of things today. I bet he doesn't play again this season. He will have some emotional breakdown and won't be able to play at the weekend. "I don't know how many illnesses he has had this season but the fella is not kidding me. That is not a proper performance. He isn't giving everything and there is a lot more under the bonnet. "He wasn't fit to wear the shirt for me tonight and I have seen this a lot this season and it needs to be said." Wenger hit back at Keown's comments, as he offered a stout defence of Ozil's performace: "I don't agree with those comments. You will see that when you analyse his physical performance that he gave a lot tonight. 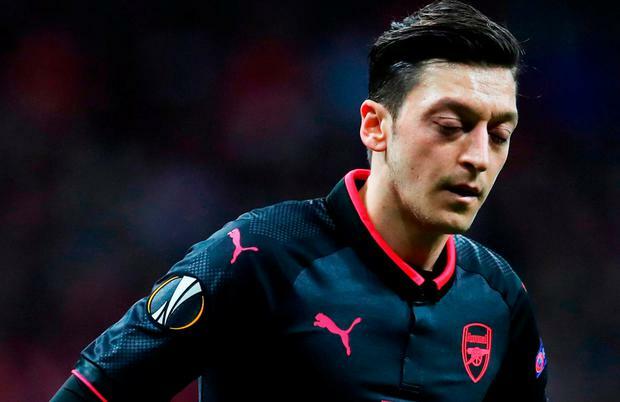 "It was a difficult game, physically very intense and I am convinced that Ozil should not be now victimised by anyone because we did not score. We had plenty of opportunities in the two games and we lose as a team. "I don't agree with that coming out now straight away. When you want to be listened to now, you always have to be extreme, but football is more complicated and complex than that."